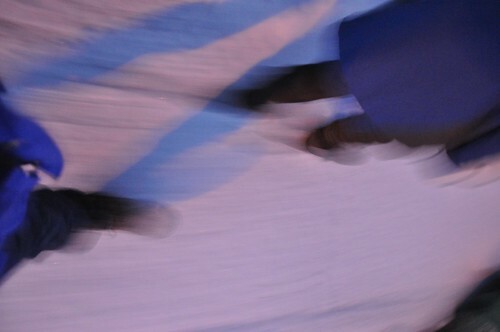 Two on a night walk. I like the washed-out colors of winter. The sky’s broad brushstrokes of pale blue, pink, yellow and gray, the dark silhouettes of bare trees, the muted greens and rusts. I like the way winter smells of wood fires and oranges, and how the cold air burns the insides of my nose during night walks with my daughter. I like that days lend themselves to bowls of creamy cauliflower soup drizzled with browned butter, tasting as pale as the world outside and toasty as a handmade quilt. 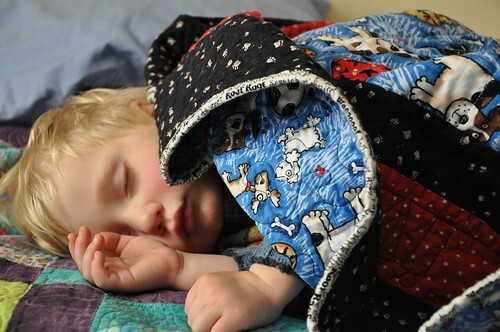 Ivan under his Christmas quilt. Garnish: Optional but for the browned butter because it’s so good. Wash and core the cauliflower. Reserve about 12 tiny florets and roast them in the oven at 400 degrees until tender. Roughly chop the remaining cauliflower and set aside. In a pot, heat the butter over medium heat. Add the leeks and cook until soft, but not taking on any color. Sprinkle the flour over the leeks and stir to combine. Gradually whisk in the stock. Bring to a simmer. Add the chopped cauliflower and return to a slow simmer. Season with salt and pepper. Simmer, stirring occasionally with a wooden spoon to keep the bottom from sticking or burning until the cauliflower is fork-tender. Remove the pot from the heat and puree the soup in a blender until silky smooth. Once processed, pour back into the pot. Place the pot over medium heat. Add 1/4 cup of heavy cream and bring to a simmer. If the consistency is too thick, add milk. Adjust the seasoning with salt and pepper. Add in a few sprinkles of nutmeg. In a small skillet or pot, melt the 4 tablespoons of butter over medium heat. Keep the butter on heat until it turns a nutty brown. Remove from heat and set aside. 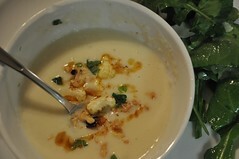 Mix the tiny cauliflower florets and the toasted walnuts in a small bowl. Portion the soup into four bowls and top with the garnish. Drizzle with the brown butter, then chopped parsley.